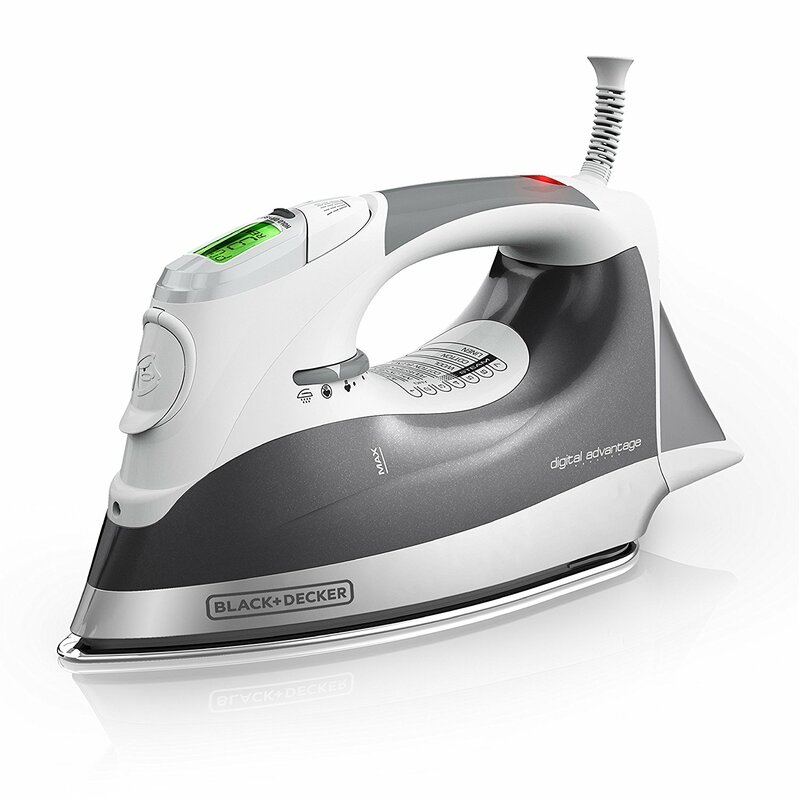 The best steam irons reviewed on this page. Here you can see the various models and brands evaluatd based on construction, function, and price. 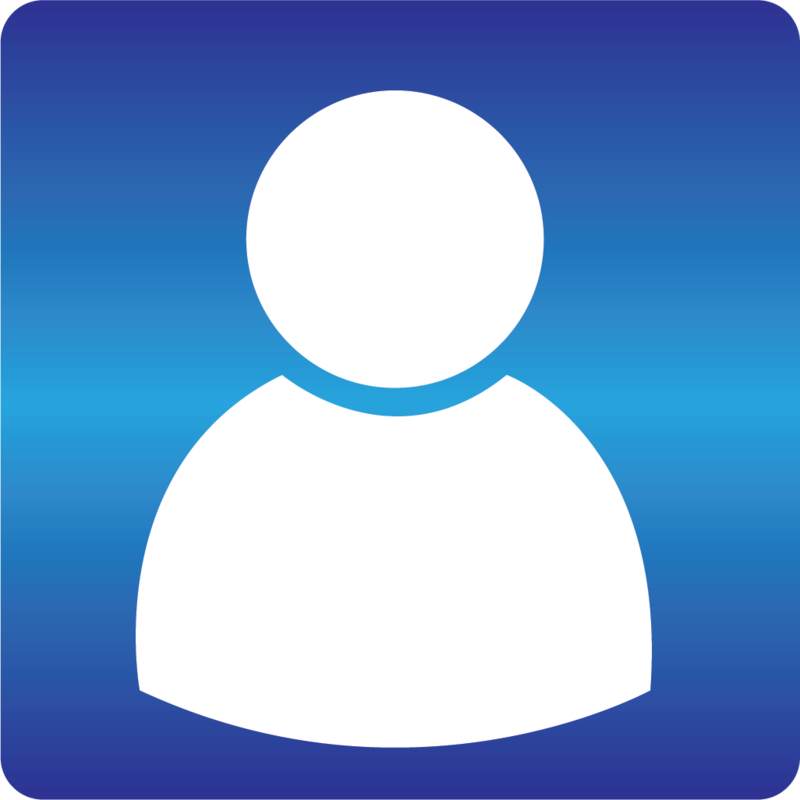 You also have to consider power, tank capacity, and other added features. A steam iron of any kind is of great help, but if you’re looking to use one to look your best on a daily basis, you need a good grade steam iron. The best I could find on offer. Starting off with the best, this beauty is an 1800 watt unit with a 10.8 ounce tank, that heats up fast and produces about 30 minutes worth of steam. Those basic stats are great, but further backed up by 400 micro holes on its stainless steel soleplate, and standard auto shutoff (30 second shutoff on face and side, 8 minutes when upright) along with a shutoff that stops steam emission (but doesn’t turn off the whole device) after a few seconds of not moving. One touch digital controls for every major type of fabric (linen, cotton, wool, silk, and nylon), use as a vertical steamer (for hanging garments or curtains), and self cleaning system round out the package. 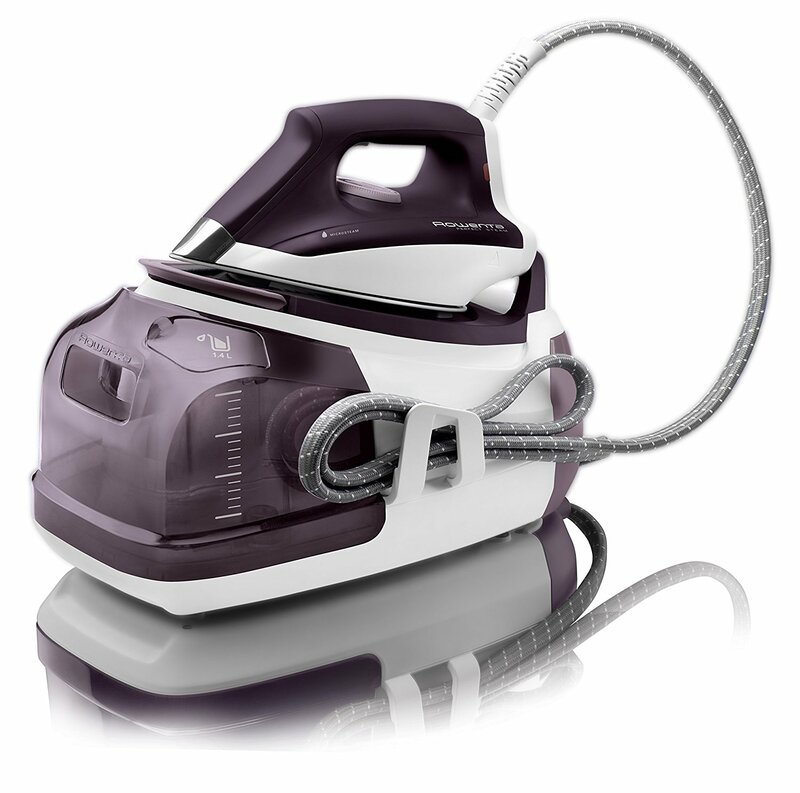 Gravity feed professional steam irons are pretty simple. You have an enormous tank (about a gallon) that hangs up near the ceiling, providing a constant flow of water to the 1000 watt steam iron. This thing’s main purpose is to be left on for hours at a time without burning out, the steam left as on demand so you can pick it up, push the button an go as needed. It does stay hot (so should be left rested on the included silicone pad to avoid burning your ironing board or fabric), and works for heavy duty fabric. If you work in a fabric shop or something (or want that experience), this is perfect, not a bad deal for a heavy duty (if no frills) machine. 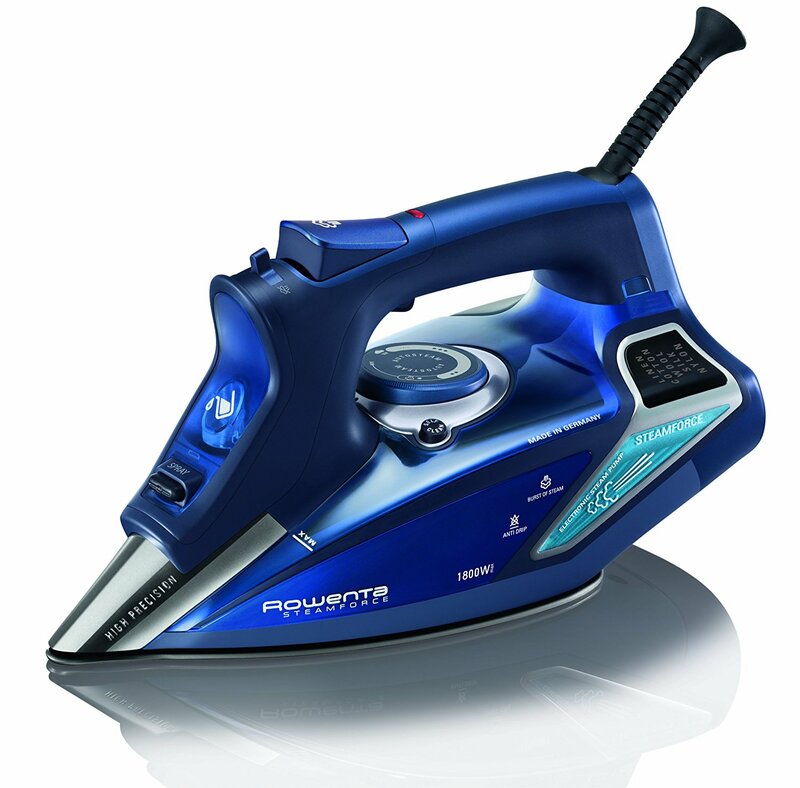 A huge difference over the other professional steam irons on offer. Mostly because it’s, well, big. What it lacks in maneuverability though, it makes up for in longevity and power. 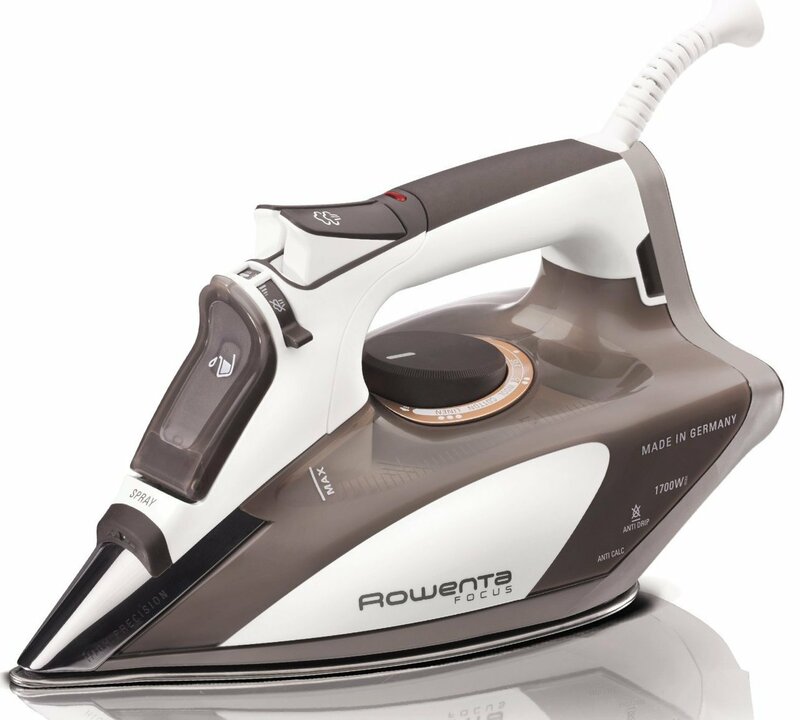 This Rowenta outputs high volumes of pressurized steam, with an enormous 47 ounce tank (1 and a half hours of continuous steam output). 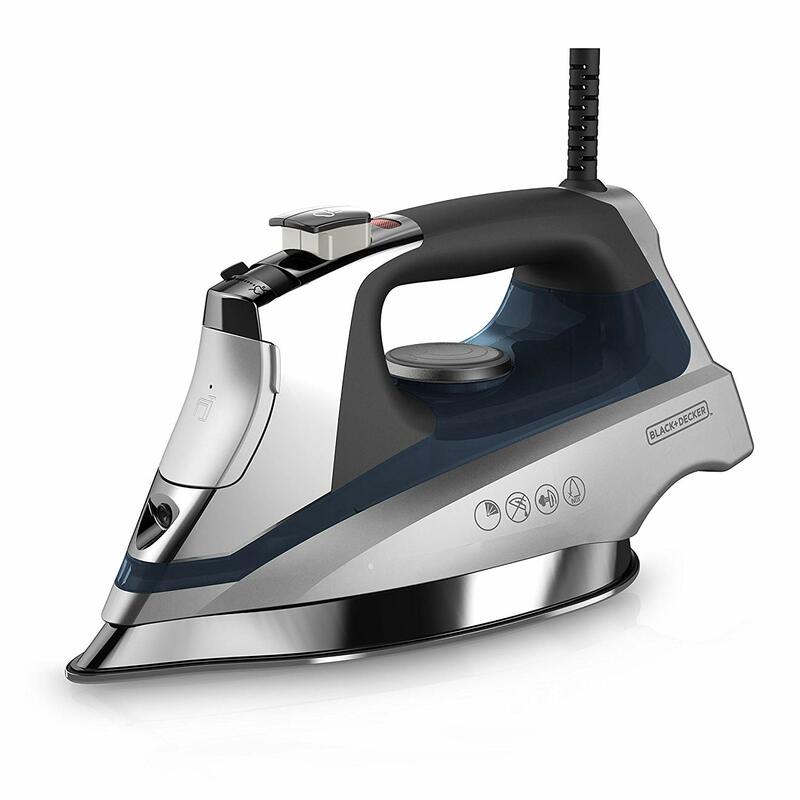 The stainless steel soleplate has the 400 microholes we’ve come to expect from top of the line professional steam irons, with a precision tip, easy to clean calcium collector, and an eco setting to save power over long periods to round things out. This makes it excellent of big jobs, without the setup (though less longevity per refill) that the Silverstar calls for. 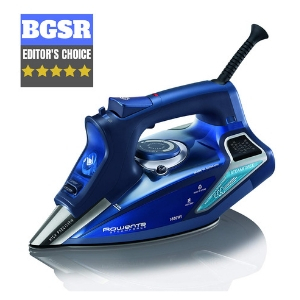 Basically, this is a midrange steam iron for professionals that need to do a lot of ironing, but don’t necessarily need the steam completely on demand at any time of day and do it as a secondary function of their job. The sticking point is the price. While worth it for what you get, this makes it something I’d suggest avoiding for anyone with much smaller volume requirements. This is basically a half price, lower function version of our winner. Most of the basics are still there: stainless steel soleplate with 400 microholes, plus standard auto shutoff. The wattage is 100 watts lower, and the tank is .8 ounces smaller, so similar there. It similarly keeps the auto cleaning system, use as a vertical steamer, and steam burst features, as well as the steam temperature automatically adjusting to the soleplate temperature (to help avoid scorching your clothes). The main differences are it lacks the digital steam settings readout (preferring manual knobs instead) and stopping of steam emission when left still for too long. 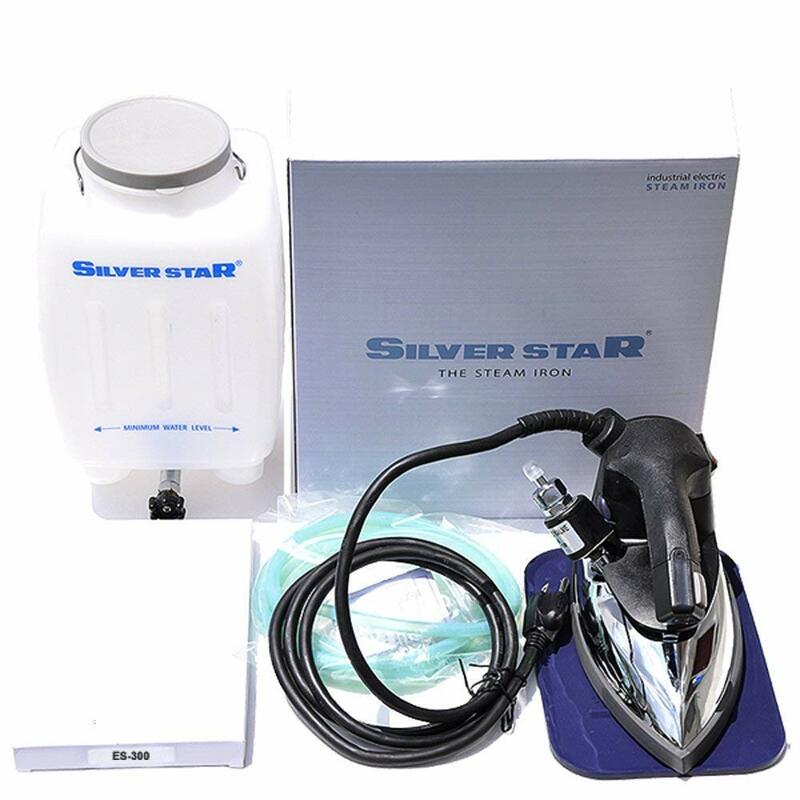 Depending on how much you value those extra features and slightly higher heat and capacity this one could be a much better buy, excellent for smaller spot jobs or as a supplement to a larger and bulkier steam iron like the Silverstar that doesn’t work for vertical steaming. A few more frills than our final pick. Basic stats are good: 64 holes (and none in the middle, so may take a few extra passes), auto shutoff, digital temperature controls (and it flashes READY when the steam is hot! ), anti drip technology, and auto cleaning. For the price it’s not bad at all. The main issue is it can’t be used as a vertical steamer as well as some others; it lacks a steam burst feature, and that can be pretty key for heavier fabrics. Other than that though, one of the best cheap options around. The main issue I have with this one is that it’s super light (1.8 pounds), meaning you’ll need to do some pressing. Other than that, it’s pretty great for the price. It produces 30% more steam than similar priced competitors (the two it compares itself to are the T-Fal FV4476 and Shark GI405, the smaller brother of the Shark that just barely missed the cut for this list) has auto shutoff and self cleaning options, a nearly 13 ounce tank, and can be used as a vertical steamer (turning my one gripe into an advantage in that scenario, it’s very easy to maneuver as a garment steamer). For the price tag (and digital settings available if you’re willing to pay another more), it’s a really great steamer. Depending on your need, any of these can be great for you. While I stand by the top 4 as the best (and trust me, I didn’t INTEND for Rowenta to dominate this list so much), either of the bottom 2 are also great in their own right as supplementary professional steam irons or ones used more in a home setting or to keep around your office to freshen up a suit in the middle of the day. There are three main criteria I use to weed out the lesser professional steam irons: construction, function, and price. Generally, professional steam irons are going to share a few basic features. 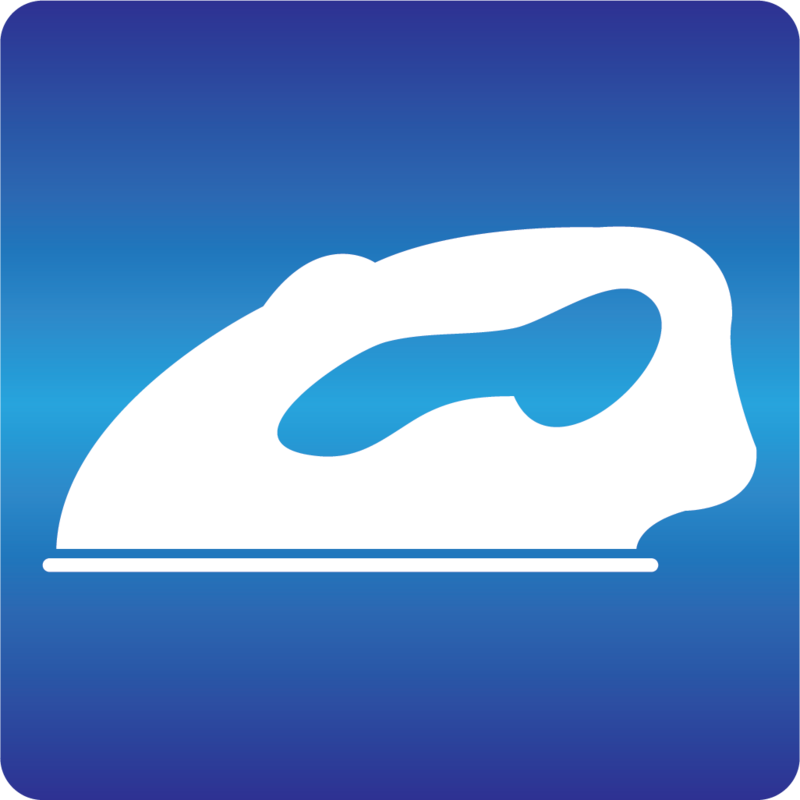 They’ll have a stainless steel, ceramic, of blended soleplate with 400 microholes for steam. The handle will be ergonomic and it will likely have a digital setting readout of some kind (though that’s not a requirement). It will be between 3 and 4 pounds, what I’ve set as about the optimum weight (not too light you have to press hard, not too heavy it’s cumbersome and uncomfortable to use). A professional steam iron needs settings for every kind of fabric, a steam burst (usually), and it needs to heat up fast and produce steam for long enough to get the job done. 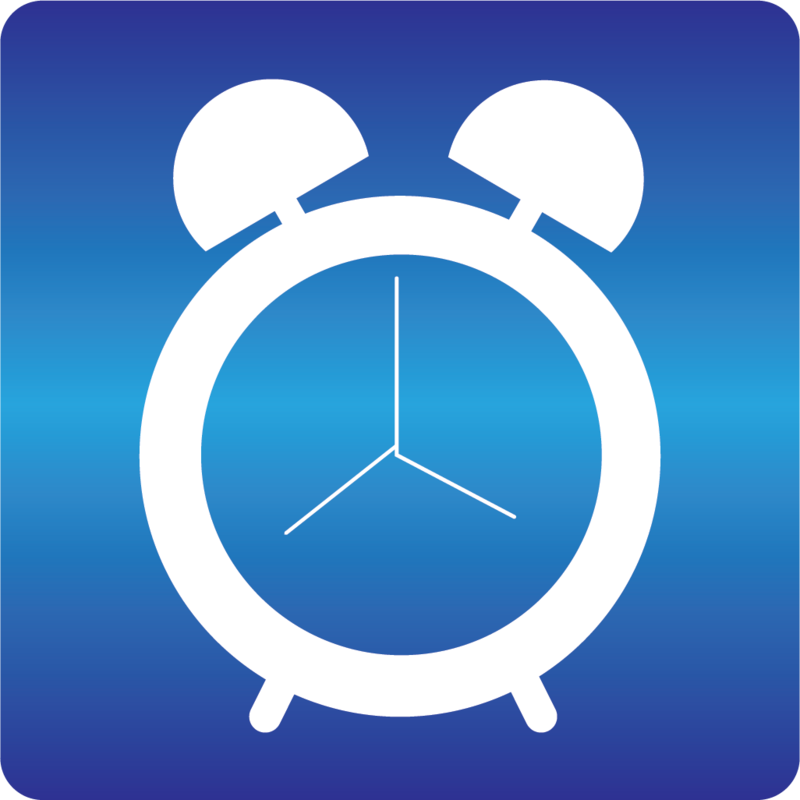 You should be able to fill it up, turn it on, and get to work in under a minute, and go for about 20-30 on a single refill. Additionally, it needs to not sputter or drip, and an auto off feature is nearly a must (with one major exception here). Price will vary. The price here isn’t as much the issue as whether the price is fair for what you’re getting. There are a lot of overpriced options out there. Basically, everything on this list is valued as far as what you get for the price, not so much detracting or adding points if it’s expensive or cheap.